GRAND HAVEN – The wind gusts in the third quarter were so strong at Grand Haven High School that the ball blew away in front of Muskegon center D’Andre Mills-Ellis, and a toppling kicking net on the Big Reds’ sideline nearly became a hazard. 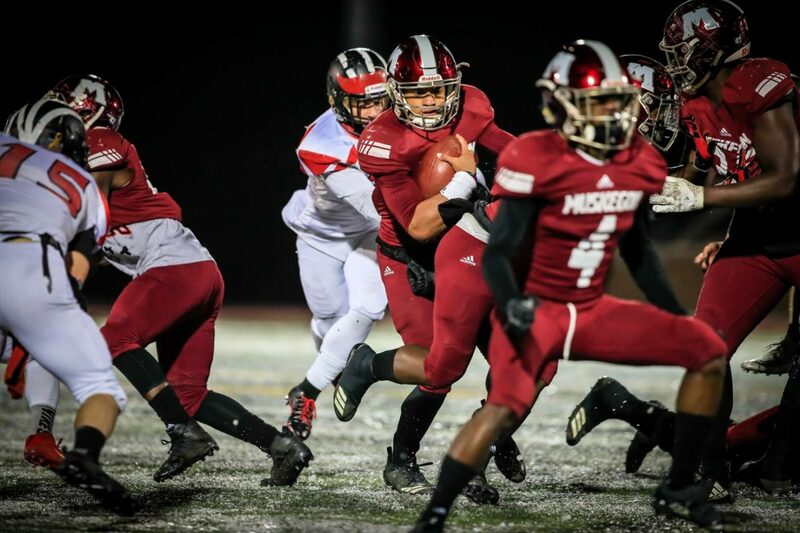 But the blustery conditions and temperatures in the mid-20s didn’t cool down a determined Muskegon squad, and couldn’t slow down junior quarterback Cameron Martinez, who can run like the wind. Martinez rushed for 180 of his 222 yards in the second half, including two long touchdown runs in the pivotal third quarter, sparking the Big Reds to a hard-fought 34-18 victory over Cedar Springs in a Division 3 regional matchup. Muskegon, the defending Division 3 state champion, improved to 12-0 on the season and ran its win streak to 26 straight games. The Big Reds will look to clinch their third straight trip to the state finals next weekend, when they will return to Grand Haven to take on Zeeland East in the state semifinals. Zeeland East routed Parma Western on Friday. With his impressive yardage total and four touchdowns against the Red Hawks, Martinez passed La’Darius Jefferson’s school record of 2,095 rushing yards, and tied Jefferson’s record of 33 touchdowns in a season. Cedar Springs seemed determined to pull off an upset after playing an inspired first half. The Red Hawks’ Wing-T offense ran up 164 yards on the ground before halftime, and more importantly, controlled the clock and limited Muskegon to just 13 offensive plays. The Big Reds started out strong, taking advantage of a horrible Red Hawks punt, getting the ball at the Cedar Springs 15-yard line and scoring on a four-yard run by Martinez. But Cedar Springs carried out their fakes, executed their blocking scheme and ran the ball hard against the Big Reds. That allowed the Red Hawks to answer right back with a sustained drive that led by a five-yard TD run by quarterback Kolby Swank. Muskegon responded with a huge special teams play to regain the lead. Freshman Myles Walton fielded the ensuing kickoff, broke through the first wall of tacklers, and sprinted free for a 75-yard touchdown with 4:41 left in the first quarter. But the Red Hawks’ defense stiffened in the second quarter, and they continued to pound the ball on the ground. Fullback Ethan West’s 20-yard score with 3:40 left in the second trimmed Cedar Springs’ deficit to 13-12 at halftime. Muskegon coach Shane Fairfield said his team made a few minor adjustments defensively, and realized they needed to play more smash-mouth football on the offensive side. Muskegon linebacker Ali’Vonta Wallace, who had 11 total tackles, said keying on Swank helped slow down the Red Hawks’ attack. 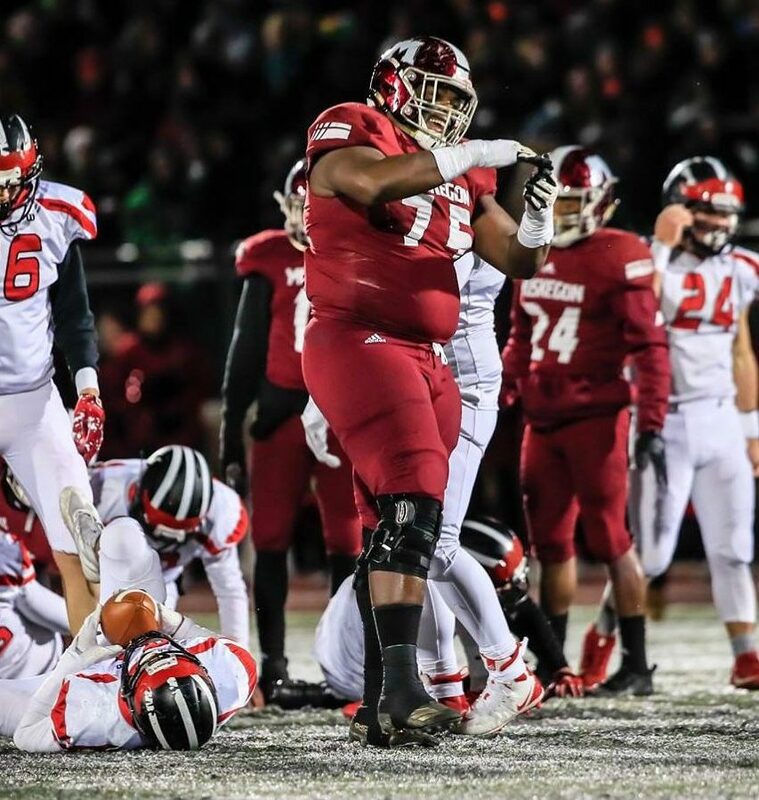 The Big Reds’ O-line also responded, helping Martinez score on tremendous runs of 32 and 75 yards in the third quarter, which allowed Muskegon to take control. Martinez capped the Big Reds’ final scoring drive early in the fourth when he leaped over a pile of players near the goal line and landed easily on the icy turf in the end zone. Cedar Springs added a late touchdown, but it was too little, too late. Jeremiah Lockhart had 51 yards on nine carries for Muskegon. Neither squad completed a pass during the game, which wasn’t surprising considering the weather. It could be more of the same in the forecast next weekend, but with a trip to Ford Field on the line, Muskegon will take it.